The In-Market RV Shopper’s Purchase Decision? Can our brand messaging “infiltrate” the active buying consumer’s purchase process and can we effectively “guide & direct” buyer decisions? 2. Can an RV manufacturer – at reasonable cost – capture market share, improve speed-to-revenue on launches and increase sales by “implanting” key selling messages into consumer buyer minds – while buyers are deciding which brand they should purchase? 1. Be Visible Where Online RV Consumers Are Actively Shopping. 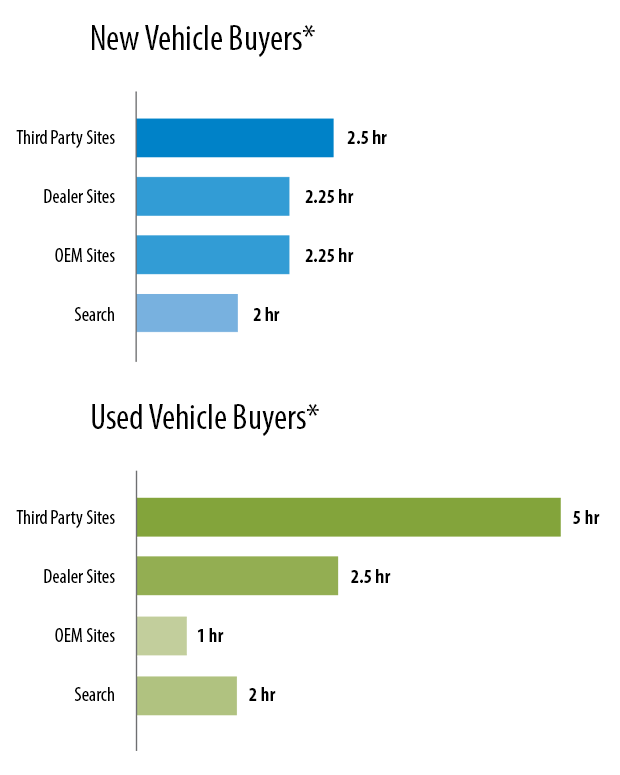 In a landmark study, “2013 Automotive Buyer Influence Study – Sources That Influence Purchase”, IHS – Polk revealed that the majority of a vehicle buyer’s shopping time takes place on 3rd party lead generation websites – sites like RVT.com. 2. Optimize Your Targeting Strategy. With the bold, new realities in online buyer behavior – plus – given the ways we can “track” consumer buyers – sophisticated, fresh targeting channels are now unlocked and opened up to OEMs who want to get directly inside the RV buyer’s shopping experience. Simple: Choose to market to (i.e. choose to sway) buyers who are searching by Class of RV i.e. show 5th wheel shoppers special messages about your 5th wheels. Brand-Specific: Message buyers who are already searching for your brand. Known as “own-brand” targeting, this tactic helps solidify brand preference and minimize “Brand Defection” which so often happens on the dealer’s lot. Are you sponsoring a country music festival or a pro motocross rider? Does your ideal buyer drive a Subaru or a 1/2 ton pickup? Subaru enthusiasts or country music fans. RVT.com at 1-800-282-2183 x 710. Arguably the most powerful (and opportune) moment in the consumer’s buying process is that all-important 1 or 2 minutes a buyer first spends looking over an RV classified listing – for your brand. 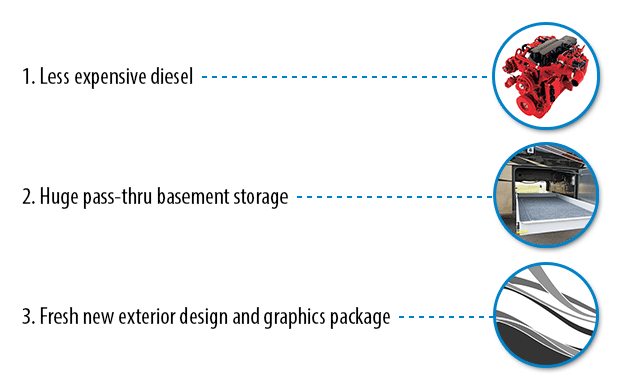 It makes a lot of sense for OEMs to establish a presence on RV classified listings. Use Display Ads on RV listings to drive interested buyers to your Website by reinforcing your brand’s positioning and messaging strategies. Notably impact buyers by leveraging Position # 2 on every listing for your brands. NOTE: OEMs that choose to engage buyers on RV classified listings for their own brands enjoy Click Through Rates (CTRs) that are “orders of magnitude” greater than average Internet banner advertising. 2 to 6 X more clicks. Rationale: They are so targeted and so completely relevant to the buyer’s “search intent” that the level of engagement is unbelievably strong. Internet “banner advertising” is not what it used to be. The value of onscreen Real Estate – if you want your message to impact true, in-market buyers – cannot be overstated. Typical, Relative Display Ad Sizes. 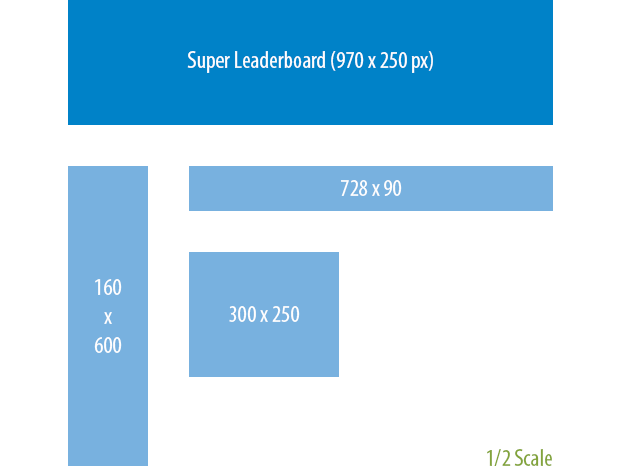 Depending on the application, the Super Leaderboard above can pull 5 to 25 X more clicks than standard, cross-industrial Internet banner advertising. 4. How To “Take Possession” of the Consumer’s Buying Cycle. It’s one thing to place a branded Display Ad in front of a buyer one time. It’s another thing altogether to “continue to market to” – or to re-market – RV buyers. Re-Marketing: To identify a known-buyer and then to continue to market to that individual over a period of time. 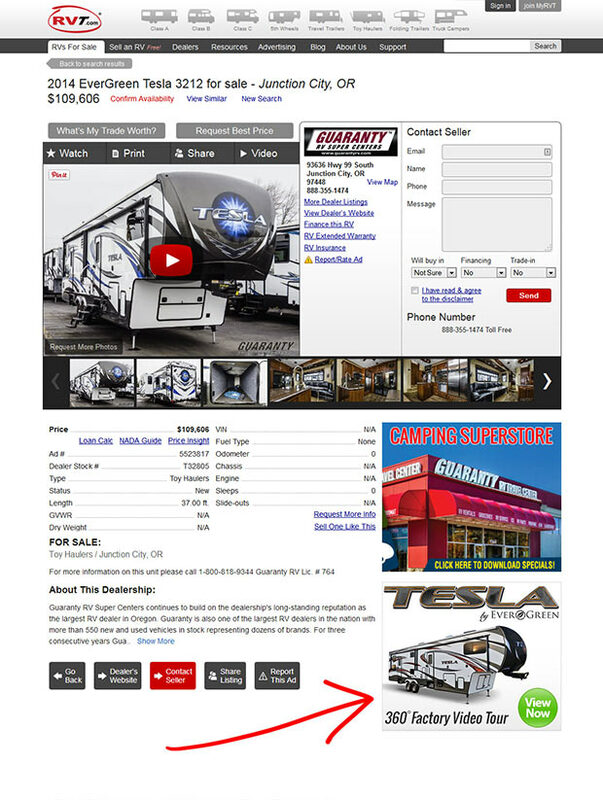 Whenever a buyer comes onto RVT.com and shops for an RV, we place a cookie on that buyer’s browser. That cookie allows us to show that buyer your messages (branded Display Ads) wherever that buyer goes online … across virtually 90% of the Internet … for (almost) as long as you want. Right Message: Tell buyers why they should purchase your brand, not your competitor’s brand. Right Buyer: Non RV buyers do not normally “cruise” RV classified listings. Let’s say your latest 2015 model has several key differentiators engineered into the product. Your objective: Ensure this product’s key differentiators are fully communicated to every buyer. Tactic: Re-market (or follow) buyers for 4 weeks. Frequency: Do not overkill buyers. Strategically limit the number of re-marketing impressions you serve per day, per week and limit the length of time you follow buyers for. 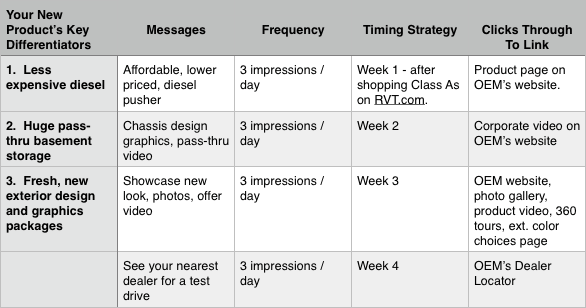 Messaging Strategy: Change messages each week. Interested in developing a customized re-marketing plan for your brands? Request a no-cost OEM Re-Marketing Strategy Session & Plan with a professional Re-Marketing Consultant at RVT.com. Call 1-800-282-2183 x 710. Directly influence brand preference among actively shopping RV consumers. Decrease costly “Brand Defections” that happen when consumers arrive at dealerships. 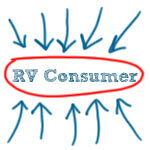 Favorably impact RV consumer purchase decisions. Your comments are valued and always welcome.